When I met Maya Marom in Tel Aviv, she handed me a box of spices and flavorings, which meant that when I returned home, I could recreate many of the wonderful dishes that I enjoyed there. 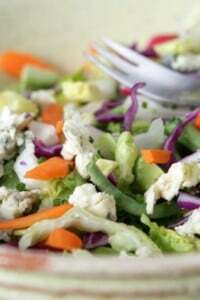 The best things I had in my travels were the salads loaded with fresh vegetables, which are served at breakfast, lunch, and dinner, and are especially welcome when the temperature climbs in the summertime. Maya was born in Arizona, but moved to Israel when she was three months old. She is a self-taught cook and baker, and has a gorgeous blog, Bazekalim as well as self-publishing her own food magazine. 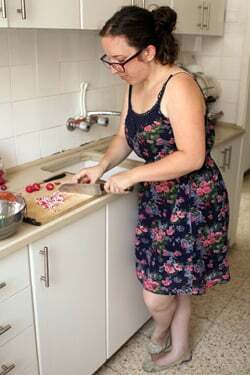 When she invited me over for lunch, she prepared what’s known as Israeli salad in her country; a finely chopped mixture of raw vegetables doused in a lively dressing with a typically Israeli flourish of lots of fresh herbs, chopped and mixed in at the last minute. 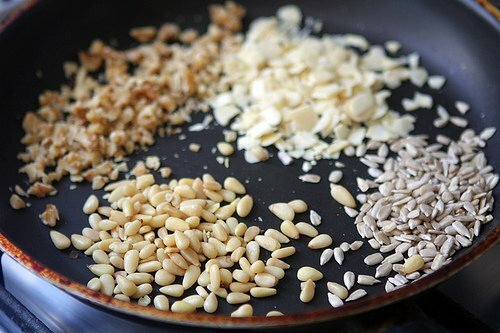 She also adds toasted seeds and nuts, which gives the salad even more crunch. Israel is a land of immigrants. While most of my friends were born here, their grandparents were born in places like Iraq, Russia, Yemen, Morocco, Poland, or even Romania – like mine. So it’s not uncommon for dinner tables to include a mix of Lebanese, Italian, and Bulgarian cuisine, all at once. Everyone will happily mix everything in their plate, and will make a point of explaining to you how authentic their grandmother’s food is, and how it is better than yours. When it comes to salad, the Israeli Salad could just as well be called Arab Salad – since all of us here around this region of the Mediterranean can’t get enough of the stuff. And there are as many variations to this salad as there people who eat it: my dad, for example, likes his salad in large meaty chunks, and douses it with a whole bunch of chopped dill, much to my mother’s disdain (“It’s the way Romanians like it!” he says). My grandmother will always add red peppers to hers, and my favorite place to get salad (Orna and Ella Bistro at 33 Shenkin Street in Tel Aviv) always peels the cucumbers and mixes in five different kinds of chopped fresh herbs. 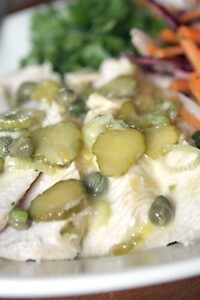 Some versions of the salad even include a cupful of cold water and ice cubes, which turn it into a kind of soup, usually served as a refreshing side to hearty stews. As a food writer, I’m the one who does most of the cooking around the house. And when I need to hand in three recipes a week, you can imagine the amount of cooking and recipe testing that needs to go on, and respectively, the amount of dishes piling up in the sink. Thankfully, me and my boyfriend reached a very agreeable arrangement: he does all of the dishes in exchange for tasty meals every day. What most people don’t know about Danny, though, is that although he’ll never bother himself with any actual cooking, he chops the best salad ever. See, he’s about to finish his masters in Statistics and Game Theory. And if there’s one thing these people know how to do – is find out how to do things perfect. Which is why, whenever I crave a nice little salad, I have to wait around 40 minutes for Danny to get his perfect chopping on. But I don’t mind it that much. Besides, hexahedron-shaped morsels taste better. Some of my friends would consider the idea of giving a recipe for a salad quite entertaining. 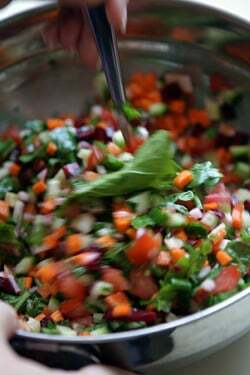 Especially since out here, this kind of salad is a staple on every family table, served almost every day. This rather elaborate version is a little more sassy than your average everyday salad, but worth the extra hassle. It’s inspired by a tiny little cafe in the Mahne Yehuda food market in Jerusalem, called “May 5th”. The owners will buy the fresh vegetables every morning from the next door produce stand, and keep them in a pretty basket, unrefrigerated, ready to be chopped to order. 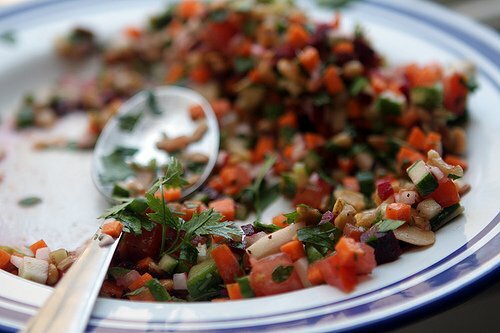 They also add in some raw beets (very finely chopped – delicious! 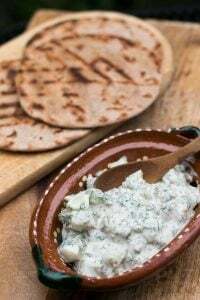 ), kohlrabi, a handful of toasted nuts and seeds, and, finally, balance it off with crumbled Tulum, a Turkish-style salty cheese they get at the Basher cheese stand. Although they didn’t chop their vegetables into exact hexahedrons, I was still blown away by how fresh and substantial this salad was. This salad might fool you: it doesn’t look like much, but it packs a punch. You can add in more chopped arugula to give it more volume if you’d like – but you’ll still be surprised by how filling it is. Again, you don’t have to include all of the listed vegetables. It’ll taste just as great with just half of them. If you can’t find all the nuts or seeds, substitute others, or omit altogether. When I made this salad for David I even forgot the cheese and onion (and a thousand other things! ), but it still came out great. Maya’s Note: Try to find small Persian cucumbers, as they are juicier and have a more concentrated flavor than the common “jet-puffed” supermarket cucumbers.David’s Note: Maya calls for either cilantro or parsley, you could take it in a different direction perhaps with some fresh mint, chives, or a bit of tarragon. I’ve had salads like this in Greece, and other Middle Eastern countries (and even in America) where the locals adopt the idea and name it after their own country. Of course, this salad can be scaled up accordingly, to feed a larger group. 1. Chop all of the vegetables into the tiniest cubes you can manage. Preferably 1/4 inch thick (or Brunoise, as the French call it). Gather the arugula into a tight bunch and slice into thin shards. This makes the salad fluffier and easier to chew. 2. Toast the nuts in an empty skillet (no oil required) over medium heat, stirring or shaking the pan frequently, taking care not to burn them (watch out for pumpkin seeds, as they tend to ‘pop’ while toasting). Toast until the aroma is released and the nuts take on the slightest bit of color. Remove from heat and let cool. 3. In a medium bowl, mix all of the chopped vegetables with sliced arugula, toasted nuts, and dress with the lemon juice, olive oil, adding salt and pepper to taste (don’t forget that the cheese is salty). 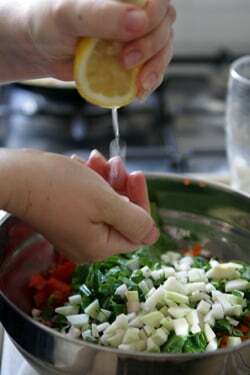 Check for seasoning and add more lemon juice and olive oil to your liking. Top with the crumbled cheese and serve immediately. You can visit Maya at Bazekalim. I think I made the Mexican version of this international salad tonight. I’m looking forward to trying this Israeli twist! Maya is right – there are so many variations on the Israeli salad, I think you’ll find even more disagreement on the matter than on where to eat the best hummus. She’s also right that what matters is using good quality vegetables and finding the right mix for you. I’m of the dak-dak persuasion (1/4 inch cubes = too big) and like my veggies cooler than room temperature. Fresh mint is wonderful in this salad. I love reading about your trip. A note from Istanbul: “tulum” is a sharp (and often slightly funky) Turkish goats cheese. 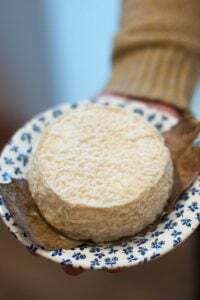 It takes its name from the goatskin sacks it is matured in (alarmingly these are kept hairy on the outside, which makes your average cheese shop look pretty odd). What a coincidence, I just love her blog batsek alim it is an amazing source for very detailed cooking of great recipes !! 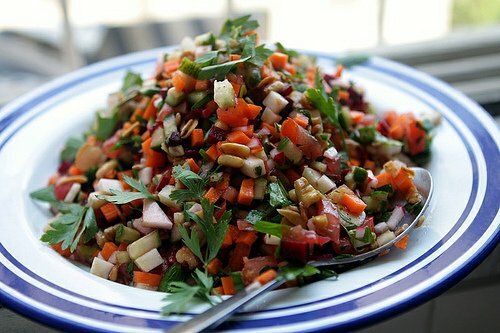 The salad looks absolutely amazing, the only problem is to find a way to chop the vegetables without cutting yourself !! Thank you for this great post !!! I always wanted to know how to make this one. I’ve had it plenty of times but never knew what gives it the twist…and the red beet is an amazing ingredient! 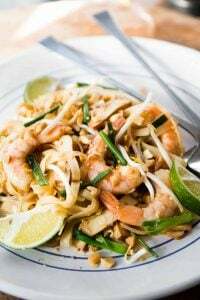 One more recipe to add to my list! Thanks! Looks lovely. Thanks, Maya! Thanks, David! Is there an English version of Maya’s Website? Next step is to try and discover the cuisine of your ancestors’ land, Romania. I can recommend a few interesting places to go and dishes to taste. Love salads, so I prepare variations of this one almost daily during summer. Dill is never missing. That looks fantastic! Good point on serving it at room temp. Here in the States we are obsessed with refrigeration (and ice), but that really mutes the flavors in a lot of dishes. As a rule of thumb, I tell people that if a dish has olive oil, then it should be served at or near room temp. Wonderful! When I was in Israel I couldn’t quite wrap my cold cereal taste buds around this type of salad for breakfast, yet it was a lovely side at the other meals. 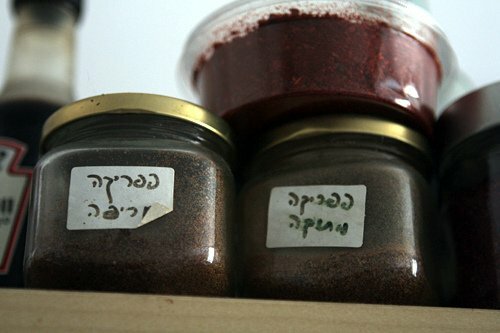 Is there an Isaraeli and/or Middle Eastern cook book you can reccomend? I’ve been dying to recreate some of the regional meals I experienced there. Thus far I have had little success. I don’t know if its the recipes, the number of possible variations, the fact that Amerian ingredients aren’t quite right, or things that I forgot like serving this salad at room temp. Books by Claudia Rodin (her A Book of Middle Eastern Food is excellent – it may be out of print, but you can likely find one used), Yotam Ottolenghi, Joanne Weir’s book From Tapas to Meze, Janna Gur, and Anissa Helou, write cookbooks with good recipes that I’ve had success with. I agree on room temp for this salad. It sounds delicious. I can close my eyes and taste the textures and flavors. Thanks for this one! Thanks David for introducing another blog I did not know. I’ve loved reading your posts about the amazing flavors of Israel, David. I usually add mint to my Israeli (Arab, Greek, etc etc) salad. Olives are also a great option. Maya – how lucky you are to have a boyfriend who can chop everything so finely into cubes and, best of all, cleans up. Does he have a brother??? my kids love to make israeli salad, they actually argue over who gets to do it since i bought them a salad chopper with two different sized grids so that we can alternate between finely chopped and super-finely chopped (the grid satisfies my 10-year-old perfectionist, at least until she gets her masters in game theory ;-) ). yes, fresh vegetables are a staple here and we cannot imagine any meal without them. Danny? What happened to Romain? Thanks Maya and David for sharing this wonderful salad. It has flavors that would interest everyone. Something to definitely try. Oh, the salad of our holiday dinners! It’s great to see variations- what great ideas this has given me. I think our simple version was limited by what was available to my grandmother in the different countries she lived in. Thanks!! What a great trip it must have been. 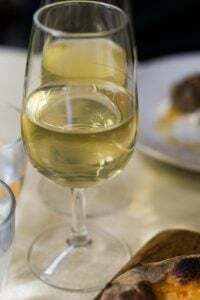 In this case, the picture is truly worth a thousand words……since my husband and I moved to the French Riviera, I have been experimenting with all kinds of different foods and cooking techniques. Will add this to the “MUST DO” recipes for Ete ici. Merci Beaucoup! This reminds me of the Bulgarian staple, “shopska salad” (with emphasis on the 2nd syllable of “salad”), which is based in the uber-fresh basic produce of tomatoes, cucumbers, onions, olives, parsley/mint and their very mild version of feta. Trying to re-create it after returning home to Minnesota after my first trip to that fascinating country last summer, I did the natural thing: amending with herbs from the garden and whatever available produce seemed like a good fit. It seems to me that the very most important element of these fresh, chopped salads is the freshest, tastiest produce you can find. Thanks for sharing this. I agree with Maya. 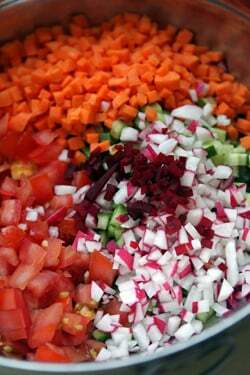 The best chopped salad in Tel Aviv is at Orna and Ella. I still dream about it. They even sell out! Thanks for the great ideas! I admit I get stuck in the tomato/cucumber/pepper rut, so it’s nice to see some variations. My officemate was a sous chef at Acadia (when we shared a room he was a programmer). I begged him to teach me how to cut the vegetables so fine and we made this video together (http://www.youtube.com/watch?v=w9ouQ_1XGxI). I don’t think most people will want to go to quite these extremes — the end product was closer to salsa than salad. Still, it’s interesting to see how totally absorbed people are in their versions of this ubiquitous salad and how many variations they can come up with. I think Yinnon might win the “Fine Chopping” award, although the ingredients are traditional. I love Maya’s pictures on her blog, but alas cannot read Hebrew…is there an English version I am missing? Thanks! Oh yes, this sounds just wonderful. I have a friend who came to the U.S. from Iran and he makes a wonderful salad that has tomatoes, cucumbers, onion, mint, and parsley, all chopped very small and dressed with olive oil and lemon. I was thinking of you on this entire trip since I know you love Middle Eastern food, as much as I do! Fresh picked and finely chopped veggies and herbs from the garden, still warm from the sun, have been the evening meal salad in my family forever. Absolutely the best of summer remembered all winter long. Love Israeli Salad — but on menus in Israel they call it Arab Salad and here in New York on the menus in Israeli restaurants they call Mediterranean Salad — a rose by any name would smell as sweet — so too with this amazing salad! 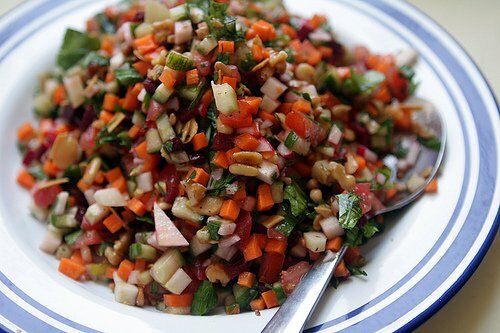 What a perfectly chopped salad, I love how textured it is! It looks very yummy ! Wonderful– just in time to accompany our 4th of July BBQ feast! Does Jicama grow in Isreal? It soundsl like a natural addition to this combination. Everybody has his or her own version of “Israeli salad”. When I asked my daughter-in-law for her recipe, she laughed and said whatever suits you or whatever you have on hand plus. I guess the plus is love and care – hers is the Yemenite version as that is her background and the salad is always delicious. 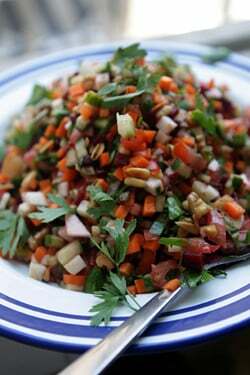 I make a couple of similar salads, but never used beets or the nuts. Sounds like something really tasty and healthy you could kind of live on in the summer. Beautiful photos, too. Thanks so much for sharing this journey with us. Looks like the perfect thing on a hot summer evening. Thanks for the inspiration, David. This is just the sort of thing I not only love during the Summer, but all year round as most of these ingredients are not seasonally limited here in California. As other readers have pointed out, it is really versatile and lends itself to fIexibility with the ingredients. I can’t wait to try it out, but will not be able to resist playing with it just a little. Thank you for another gem. Do you know if it’s possible to read Maya’s blog in English? Thank you for posting this! I’ve been trying to replicate something like this since we visited Israel three years ago and it’s never been “quite right”. So glad you got to visit that wonderful country and experience the great food and extraordinary people! 1) This salad looks WONDERFUL! There is something so good about fresh vegetables or fruits that are cut in a small cube size and combined in a salad. I think it is from being able to taste so many flavours with each bite. 2) This past Christmas I received one of those corny “as seen on TV” onion dicing contraptions in a game of Dirty Santa. Turns out that corny contraption is fantastic at creating the perfect tiny size dice of fruits and vegetables such as those needed in this recipe. Highly recommended. 3) A few months ago my daughter and I went to afternoon tea at a hotel in London (we’re American expats living just west of the city) and were served the yummiest fruit salad I’ve ever had. The fruits were cut in the tiniest diced pieces. My daughter and I deemed the fruit salad to be tastier than anything else we were served that day including the clotted cream! Thanks, everyone, for your kind words! I, too, tried one of those infomercial-type cube cutters, and it broke immediately upon contact with my not-so-ripe tomato slice. 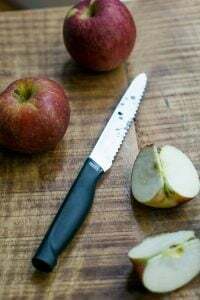 Investing in a good sharp knife is better use of your precious money. Also, signing a non-negotiable Salad-Chopping-Boyfriend-Treaty is a good strategic move for anyone, I guess! Fed this to my friend this afternoon….. a very hot day in Michigan…. wow, very refreshing, tasty, and a real keeper! This is a permanent add-in to my summer (ah heck, year ’round) favorites. But in the summer, I have so many of these greats in my garden. Thanks! Maya’s tips on how things should be chopped is bienevue: we forget too easily that the texture of what we’re tasting, and how well they’re mixing with surrounding flavors, is directly related to how large or small the pieces. Beautiful salad, and wonderful post. Maya, I am off to discover your blog and your magazine. Kudos to you! I don’t suppose you’d be willing to post a list of restaurant recommendations at the end of your trip? My grandparents and parents were from Romania as well, but the salad we always had didn’t have beets and kohlrabi. I still make similar salad for my family several time a week. I can live on that salad. I read this and had major cravings. Skipped the kohlrabi, went for parsley instead of cilantro, and added some avocado. Pretty much the most delicious (healthful) thing I have ever eaten. Thank you. I forgot to mention that chopping everything up very small is wonderful! You push it onto your fork with a piece of pita and then eat the pita that’s absorbed all the juices. looking forward to an Israeli salad soon! Thanks for the reminder. Surprised and so excited to see you post about Israel! I love the way you describe us Israeli people, such true and exact description. And the Israeli food which I know so well looks so special in your blog, too! Thank you so much, I hope you enjoy the rest of your stay, have a great time, despite the hot weather. Cucumbers are just in here in the Bay Area and the first tomatoes — soon it will be salad season in earnest. Thanks for the new variation. On an unrelated note, thanks for recommending the Eric Kayser boulangeries — I had one just around the corner on the Rue de Bac and took to going there for my morning croissant and chocolate, as well as buying whole grain breads for picnics. I nearly wanted to cry when I moved to the Bastille for my last few days and had to find a new bakery, but I enjoyed walking all the way through the Marais from my new location. I wish I had committed more of your recommendations to memory, being deviceless when I travel, but I will be back. This sounds good, but I prefer the Syrian fattoush salad, with fried pita bread, tomatoes, cucumber, onions, some sumac. 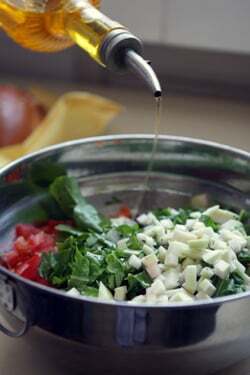 In Sicily we made a similar finely chopped salad too, with olive oil and vinegar. I know the Brits call it corn flour. Salad sounds great. I know many of us have favorites, but it is great when David presents something new for us to try. We may end up liking it better! Oops. Missed fact that David had responded re cornstarch in France. Sorry for stumbling over your note. i have heard such great things about israeli salad! can’t wait to try it. Tel Aviv is not just full of opinionated foodies… it’s filled with some of the best amateur cooks in the world. Three of the best meals I ever had were made by three different members of the same family. I fall asleep dreaming of kubbeh soup sometimes. David, I did not know you also had Jewish Arab ancestry (you mention it in this or another entry)! Min eina? Iraki Jews? 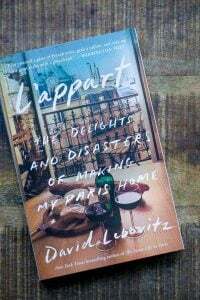 Leibovitz says it all ;) about one part of your Jewish ancestry, but not about other components! David I have just discovered your website and made the best ice cream of my life from one of your recipes (strawberry). Re Romania, I lived there for 4 months in the early 90s and spent a few weeks there again 10 years ago. It is a fascinating country, often offputting at first approach but actually very rich culturally and full of strange, only half buried history. It well repays a visit in intellectual and experiential terms even though it’s not always an easy country. 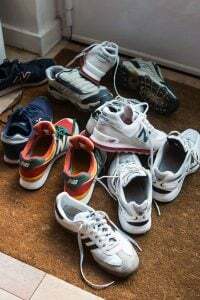 My advice would be don’t think of going in winter or high summer (stifflingly hot and Bucharest is brutal), spring is beautiful and autumn will be full of fresh produce. The markets, folk customs, gypsy life are vivid. When I was last there they still had a Yiddish theatre in Bucharest and if you like Klezmer you’ll see that’s where the roots are. Looks absolutely delicious! Thank you for the inspiration! Beautiful salad, thanks for sharing, can’t wait to make it. Love your recipes and writing…always looking forward to more. It looks like I’ll live to be 100 years old if I keep eating this… and yet it looks delicious! =) I am pretty savvy with food ingredients but I had to google kohlrabi… it’s such a cute veg and if it tastes like broccoli stem, I am so there! Excellent tip on letting the veggies come to room temperature. Like cheese, they’re just better when a little warmer! Hello David and Maya and thank you for such a wonderful recipe. Since its posting day, I have made it three nights in a row. There is something meditative about chopping all of these vegetables and being so directly involved in your meal preparation. To vary a bit, I added a little celery and some golden beets. Simply delicious, healthy and filling. Hope to see Maya’s Hebrew website in English soon. Keep up the great posts David ! I just learned how to make Shirazi salad (Persian) very close to this but you use dried mint (spearmint) rubbed between the palms and lots of lime juice (no oil at all). Ive cooked many of your recipes David; and those of your guests and enjoyed them all. This one however moved me to write when I realized that we have been eating an evolving version of this for lunch or with dinner all week. Last night we had a giant serving to end it for now. It must be the perfect synchrony of the hot weather we’ve been having here on the west coast of Canada and this salad. 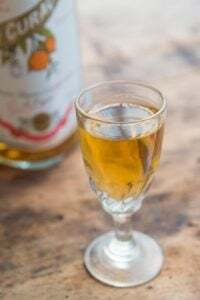 Thank you or sharing another great recipe! re romania: my grandma was from Basarabia, which was undecidedly Romanian, Ukrainian or Moldavian. One thing i recall is there was always polenta (Mămăligă) going on in her house. as always with childhood memories, it is the best eat-with-your-fingers-and-don’t-worry-about-making-a-mess dish. a trans-carpathian american myself, i can eat polenta 5 times/day. unfortunately it is rather neglected in central europe (current place of residence) that is monopolized by wheat and the like. Hmmm…best choice for dinner while having the summer-flu! I use chopped mint in my Israeli salad.